A few weeks back I decided very last minute to join a bunch of other Instagramer's in the 10x10 Challenge. Each person seemed to have a variable on why they decided to do it. And I thought I would come on and share some of my thoughts as to why I decided to give it a try and why I'd recommend everyone to do it at least once even if it's not to help in a permanent life change, it could be just a light bulb moment. First the "rules". These didn't seem to be set in stone so I made a few adjustments for my own personal use. By day 10, I had swapped out a few items. The Denim shirt wasn't something I found fit well enough to go with the Olive pants and so I swapped it for my light colored denim Jacket. I have a thing against denim on denim, I blame What Not to Wear Haha!! Easter Sunday was in the midst of my 10 days, so I decided to wear my white blazer, as it felt a bit more formal for the occasion, but then for family fun later that day I switched over to my olive pants and denim jacket. As you can see, I only have 9 days. One of my 10 was spent in pj's due to a migraine..... BUT! The other 9 went really smoothly! When I began this 10 days of 10 items, I didn't know what I would be coming out of it with. Wasn't sure I'd learn anything or just be frustrated and bored. It really was a whim decision. But, I found that through it, getting dressed was a snap. I found that I was more thoughtful about the clothes I chose for the 10 items. I took note of what it meant to have quality and diversity over quantity. And I tell you, a few different accessories, makes the simple clothing choices different each day. And I was really thrilled with how free I felt when I'd finish my shower and only have a few things to choose from. By the end I was very excited to get back some of my other items I hadn't put into my 10 items, BUT mostly the rest have just created a mass of morning confusion. Being back to normal these days, I finds it harder to get dressed. Too many choices. 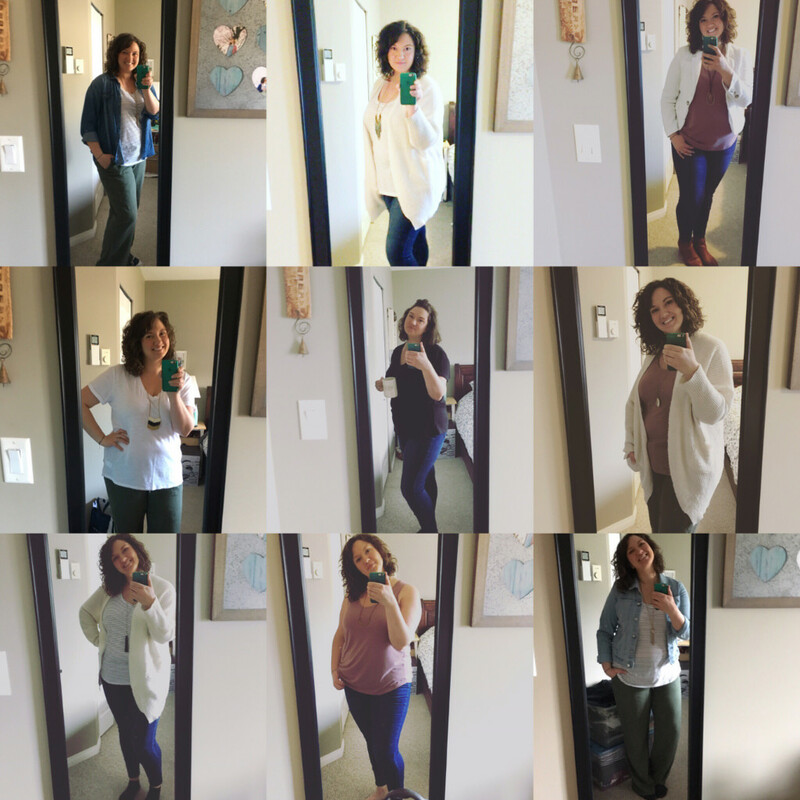 I have come to appreciate what it means to have a simplified wardrobe. So My plan is to really pair down. Pay more attention to the items that I go to more often than not. 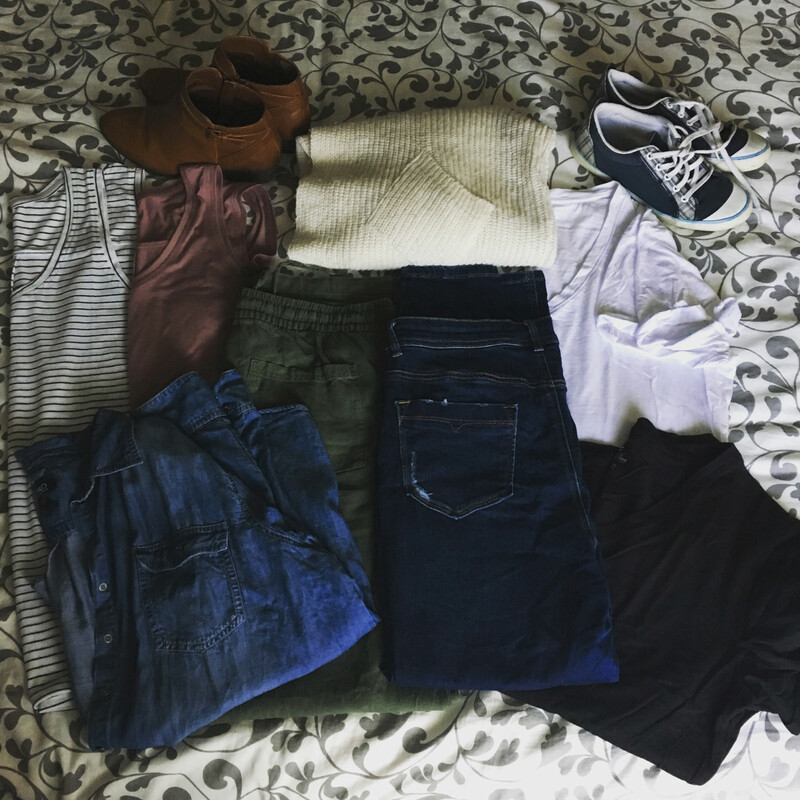 Get rid of items I never touch and only add items where I find real "holes" in my wardrobe and items I really love over following trends. Yes, I am going capsule, I guess. My own version that works best for me as a stay and home mom. But one who doesn't like wearing leggings every day. Minimizing, doesn't have to mean boring. It doesn't have to mean to limit your personality or style in clothes. In fact, I think that to minimize your wardrobe can be a better reflection of who you are, if we don't get caught up in what's "in" or not. I know it's never going to be a prefect science, but if it saves me some time and money, I am in! Haha, but more importantly I think, on a deeper level this is what I would like to do to improve my perspective on what life means. That my time is worth more. More than fast fashion. More than shopping. More than trying to keep up. I want my life to be filled with the things that will last. Looking at clothing as fun, sure, but more with the eye of the life I want to live in them.